"You oughtta be doing radio commercials: how to talk a lot and say nothing." From its opening shots, The Big Heat reeks of corruption, cruel violence, and improper activities. Policeman Tom Duncan puts a gun to his head and ends his frustrating life, and his hand reveals a note addressed to the district attorney. What does this message contain? Sergeant Dave Bannion (Glenn Ford) arrives on the scene to investigate this death, but the paper has disappeared. Only the audience (and possibly Duncan's wife) knows of the existence of this sad cop's final thoughts. Bannion immediately springs forward and tackles the case, which could lead to his ultimate destruction. Throughout his investigation, countless twists and turns lead Bannion to the dark center of himself and humanity. Shot in glorious black & white, this film explores the depths of the dark city through its criminal denizens. The lord of this metropolis is Mike Lagana (Alexander Scourby)—a suave, confident individual who conducts illegal activities without lifting much of a finger. His first appearance takes place in bed, and Lagana exudes a cold, composed demeanor even when receiving disturbing news. The brute force in his operation originates with Vince Stone (Lee Marvin), a sharp-dressed, vicious hoodlum with little regard for the feelings of anyone. He lives the good life, but also is not afraid to get his hands dirty when the need arises. On his arm is the voluptuous Debby Marsh (Gloria Grahame)—a young, fun-loving girl who hardly thinks about the consequences of his actions. After she pursues Bannion, Stone exacts his revenge in a classic moment of cruelty that remains shocking nearly 50 years after its initial release. Sergeant Bannion is an overconfident, arrogant man who has no qualms about placing his nose into anyone's business. He appears out of place in nearly every social situation and speaks only in tough-guy phrases. Inside Lagana's extravagant mansion, Bannion stands well apart from the partying and seems isolated from the social unit. An early version of Dirty Harry, he stands as a loner apart from his fellow cops and believes in discovering the truth by any means necessary. His one place of sanctuary away from the world's evils is at home with his lovely wife Katie (Jocelyn Brando, Marlon's sister) and his young daughter. These three represent the one successful family unit in this pessimistic world, and Bannion clearly loves them more than anything else. Unfortunately, his arduous investigation into Lagana's activities could lead to tragic consequences. Director Fritz Lang is primarily known for his monumental German films Metropolis and M, but he also possesses an impressive body of work in Hollywood. While this movie lacks the originality of those works, it still showcases plenty of interesting shots. Lang utilizes a dark, shadowy visual perspective that assists the bleak nature of this picture. Screenwriter Sydney Boehm has crafted a taut screenplay with stinging dialogue that jumps from the page and adds to the tension of each scene. The words remain mostly prominent today, but they do thread a fine line between silliness and serious drama. Lines like "Get out of here while you can still walk" work effectively, but their overabundance (especially by Bannion) becomes a bit overbearing by the end. The Big Heat begins with little character exposition and immediately jumps into the homicide investigation. Running less than 90 minutes, the story hardly takes a breath and rushes quickly to each new set piece. Spurred by several memorable acting performances, it overcomes the fairly basic material and offers an intense crime drama. While Glenn Ford is adequate, the highlights come from Marvin and Grahame, who inject plenty of style and weight into their performances. Coupled with a hazy, depressing visual atmosphere, their roles help to generate a film noir classic. Image Transfer Review: The Big Heat features a sparkling black & white transfer in its original full-frame format. This picture sports excellent contrasts and nicely conveys Lang's effective mix of light and shadows. The brightness level remains solid throughout the presentation, and this helps to accurately recreate the atmosphere of the version shown in movie theaters. Although this transfer is impressive, it does contain a significant amount of minor defects and vertical lines that lessen its effectiveness. While these hinder it slightly, the overall picture remains an above average, worthwhile release. Audio Transfer Review: This release includes a mono audio transfer that presents the sharp dialogue in a clear and understandable fashion. The background music offers signficant power, especially during the bar scenes with the jazz band playing. However, this track lacks the pristine clarity inherent in the best transfers, even considering its mono format. Everything sounds adequately, but nothing rises much above that level. The noises are fairly quiet and sometimes a bit fuzzy, leading to only an average listening experience. Extras Review: This disc offers only a few supplements that add little to the understanding of the film. First, there's 6 vintage advertising posters that showcase color photos of the main characters. 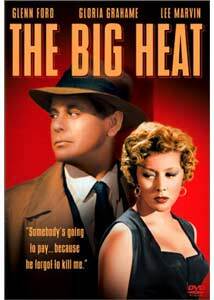 The other inclusion is a collection of theatrical trailers for The Big Heat and two other films. All three previews utilize a mediocre, full-frame picture accompanied by a mono audio track. The additional trailers exist for The Lady From Shanghai, starring Orson Welles and Rita Heyworth, and Suddenly, Last Summer—featuring Katharine Hepburn, Elizabeth Taylor, and Montgomery Clift. Generally considered one of the top film noir classics, The Big Heat still retains much of its thunder nearly 50 years after its original release. While time may have lessened some of the impact of its hard-edged dialogue, there's still plenty of energy in this picture. While possibly a step behind Double Indemnity and The Maltese Falcon, this disc is recommended, especially for young film buffs who enjoy old-style movies.